A Mexican national shot and killed Tuesday by police in Pasco, Wash., after he began throwing rocks at the police, had a previous history of erratic behavior while under the influence of methamphetamine, court documents show. Police were responding to reports of a man throwing rocks at cars at around 5 p.m. Tuesday. Pasco police said the man, later identified as Antonio Zambrano-Montes, 35, threw rocks at the officers and ignored orders to surrender. Officers tried using a Taser, but were unsuccessful in subduing him, according to reports by the Tri-City Herald, a local paper. In a video (warning: graphic video) captured by a bystander and uploaded online, Zambrano-Montes is seen running away from the officers. As they give chase, Zambrano-Montes appears to have his arms in the air briefly. When he turns to face the officers, they open fire and Zambrano-Montes falls to the ground. This is the fourth fatal shooting involving a police officer in Pasco in about six months, according to the Herald. When an officer commanded him to drop the objects in his hand, Zambrano-Montes did not comply and tried to throw a rocking chair and mailbox post at the officer. When the officer tried to arrest him, Zambrano-Montes grabbed onto the officer’s belt and tried to grab the officer’s handgun. The officer tried to subdue him by head-butting him, but it had no effect. Zambrano-Montes continued grabbing at the officer’s handgun trying to take it out of the holster. Then the officer who filed the affidavit used an “electronic control device” to restrain Zambrano-Montes and arrest him. He was taken to a nearby hospital, where he admitted to having used methamphetamines. He later pled guilty to the charges. In the days since his death, hundreds of residents have rallied and marched to protest the police’s actions. Zambrano-Montes’s family has also filed a $25 million claim against the city. 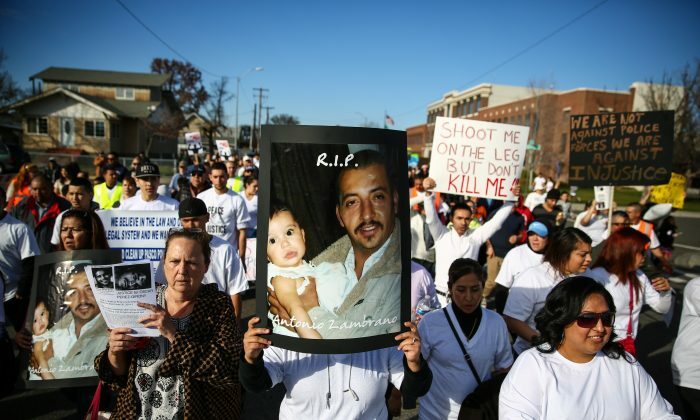 On Friday, the local Franklin County coroner announced that he will issue an inquest into Zambrano-Montes’s death, where a jury of six civilians will determine the cause and manner of death, as well as whether the police shooting was justified, according to the Herald. The county prosecutor will then review the jury’s decision and decide whether to press criminal charges against the officers. The three officers have been placed on administrative leave, while a team of investigators from local police departments is conducting an investigation. (The Pasco police department is not involved to avoid a conflict of interest). Few other details have been revealed about the incident, though Zambrano-Montes’s family members have told the Herald they were not aware that he had any mental health issues. Zambrano-Montes was an orchard worker originally from Michoacan, Mexico. The Mexican president Enrique Peña Nieto has condemned the disproportionate use of force in Zambrano-Montes’s death, according to a report by Reuters.